wanted to make Christmas/holiday cards, which got me thinking of winter scenes, particularly landscapes. 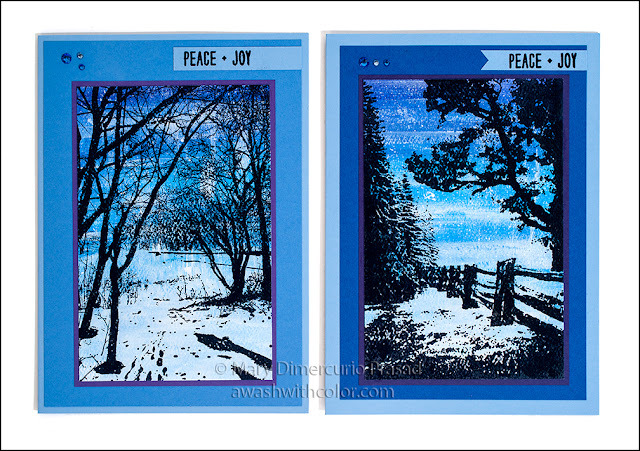 I had some Penny Black stamps that would be perfect with a painted wintery background. 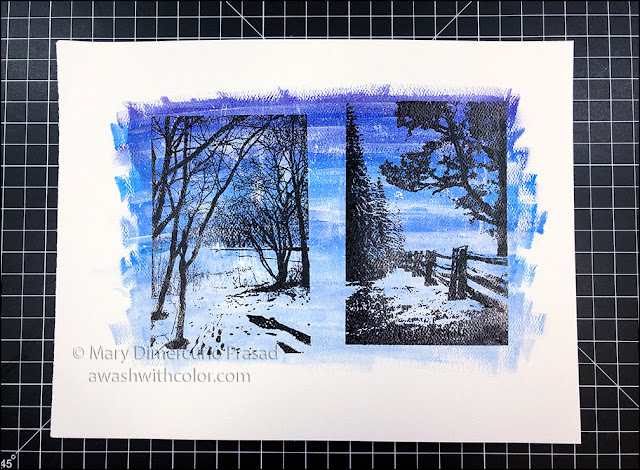 This is a super easy project - the key is to do it in layers, mixing a little water along the way to get the paint to flow across the textured paper. Normally you do not want to add water to acrylics (or very little) when painting on non-porous surfaces, but because the paper soaks up the paint, there is no problem with the binder being spread too thin (i.e. the paint won't flake off over time as it might on a canvas if too much water is added). 1. 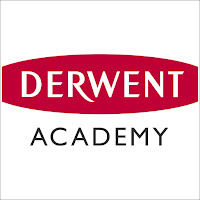 Remove one sheet of Derwent Academy Heavyweight Acrylic Paper from the pad. 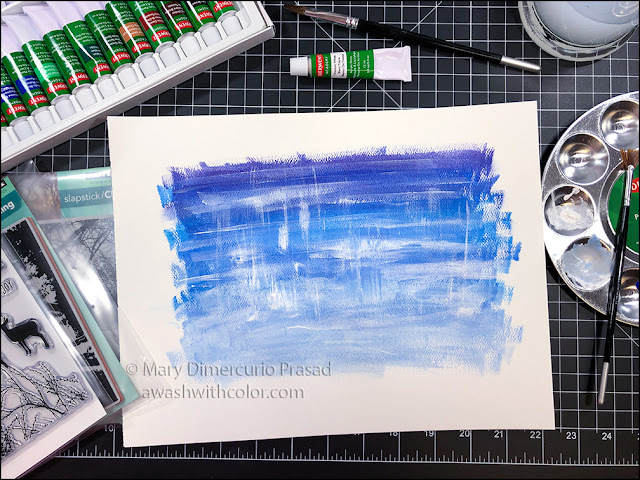 In the paint palette, squeeze acrylic paints into wells, blues and purples plus a couple white (one for mixing with blues/purples and one to stay white). 2. 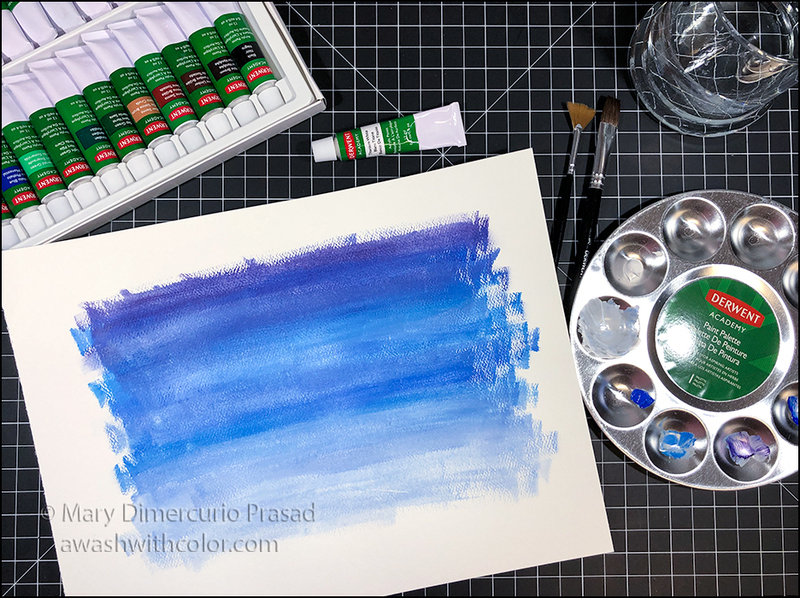 Going from bottom to top in horizontal strokes with a flat brush, paint pale blue (mix blue with white), light blue, blue, blue-purple, and purple but also mix the colors a bit as you go. Add a bit of water to the brush as needed to keep the paint flowing smoothly across the page. Cover enough of the page to make two cards. See photo. 3. While still wet, add white in areas leaving streaks. While still wet, use a fan brush to pick up white paint and add thin vertical streaks and dry brush strokes as the paint runs out of the brush. Repeat across the painting. Let dry. Add a little water to the white so it is slightly thinner. Either dip Splatter Brush into the white or paint white onto the bristle ends then use your finger to spatter white all over the page (you could also use an old toothbrush for this). Let dry completely. 4. 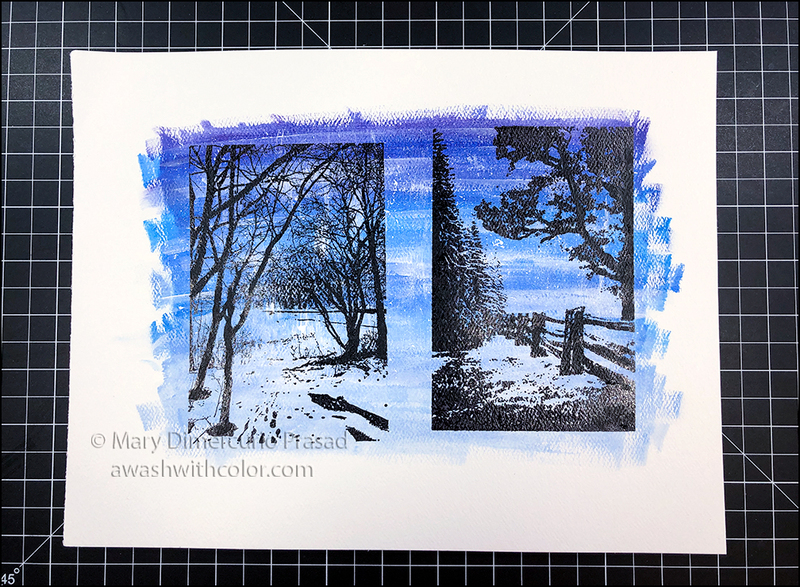 Using Stamp Platform and StazOn Jet Black ink, stamp Wintery Trail on one side of the painted image. 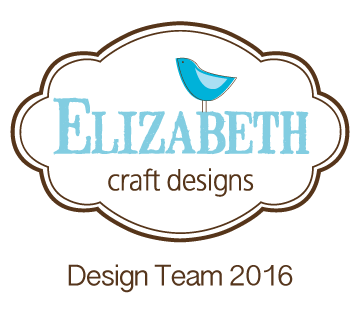 Due to the heavy texture in the paper, you will likely need to press hard and stamp 2 or 3 times. You may also want to re-ink your pad if it is getting dry. Don't worry if there are a few dots in the solid area - you can fill them in with black paint using a small brush if necessary (note: if you used paint and the shine is noticeably different when dry, try coating entire surface with Mod Podge). Repeat with Hidden Lane on the other side. I flipped my image to stamp the other side, but you could just cut the paper before stamping. StazOn ink can be challenging to remove. I recommend using StazOn All Purpose Cleaner with a stamp scrubber to clean off the big stuff, then follow up with a Stamp Shammy and water to remove any residue. Once dry, trim images to edges of stamped area. 5. 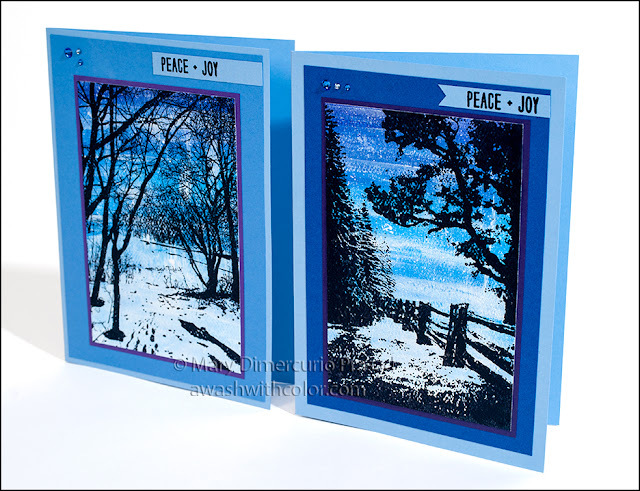 Cut 2 sheets light blue cardstock 7x10 inches; fold in half to form two side-folding 5x7 inch card bases. 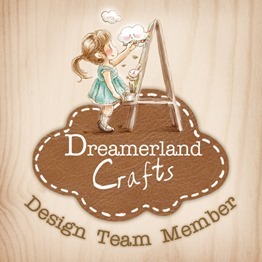 Note: I made my cards look slightly different from each other - the following are the dimensions I used for my mats. Cut dark blue cardstock 4 1/2 x 6 1/2 inches. 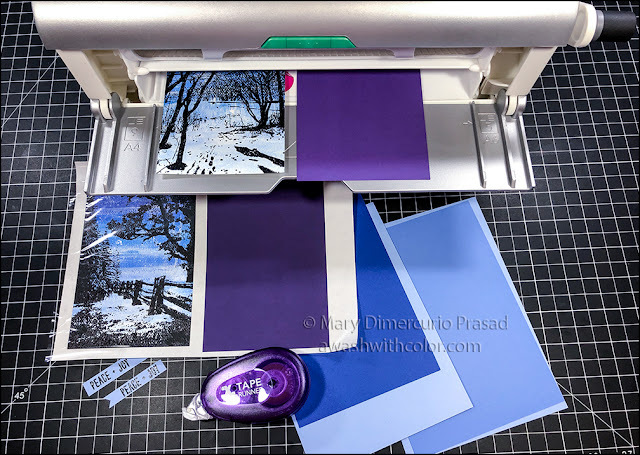 Cut dark purple cardstock just slightly larger than the Hidden Lane painted/stamped image - I used a pencil and eyeballed it but you could measure the image then add 1/4 inch to each dimension (for 1/8 inch border around). Cut blue cardstock 4 3/4 x 6 3/4 inches. 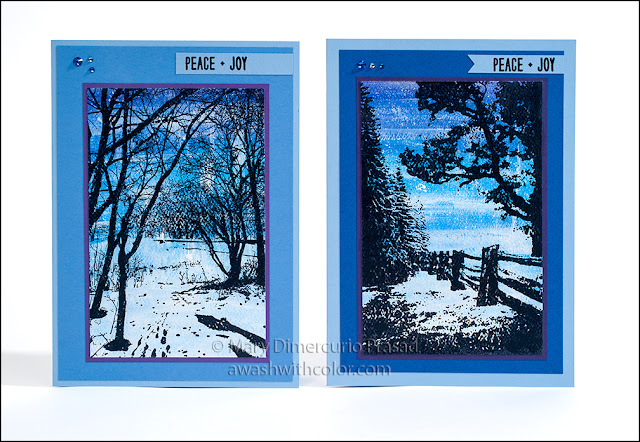 Cut light purple cardstock just slightly larger than the Wintery Trail painted/stamped image. Stamp two "Peace • Joy" messages on light blue cardstock strips with VersaFine Clair Nocturne ink (I recommend using a powder tool first). Quickly sprinkle with black embossing powder and heat. Trim to sizes shown, adding tails with detail scissors to left side of one. 6. 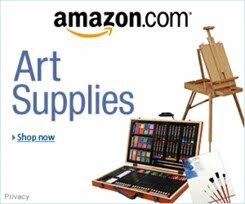 Put images and mat pieces from step 5 through 9" Creative Station with Permanent Adhesive. See photo above. Having the adhesive uniformly over the back will allow the images to stick even if they curled slightly while painting. Rub with your fingers all around edges on cellophane before removing cellophane. 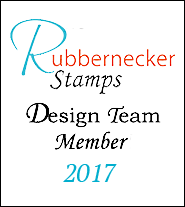 Important: use a bone folder or something hard and flat (e.g. 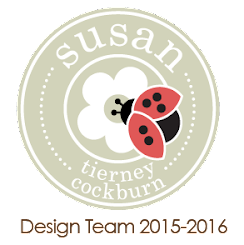 spoon edge) to rub the backing sheet behind the images so the adhesive will stick to the textured areas. To help keep items flat, pull backing sheets off away from back sides. Adhere images to their respective mats then adhere to larger mats, then finally to card fronts - see photos for placement. Use Tape Runner to add adhesive to backs of sentiments and adhere where shown. 7. Adhere flat back crystals where shown (I use Swarovski crystals - they are gorgeous). I recommend using a Crystal Katana or Tanto for easy placement (dip toothpick in glue and put dots where desired, as you hold up rhinestones). 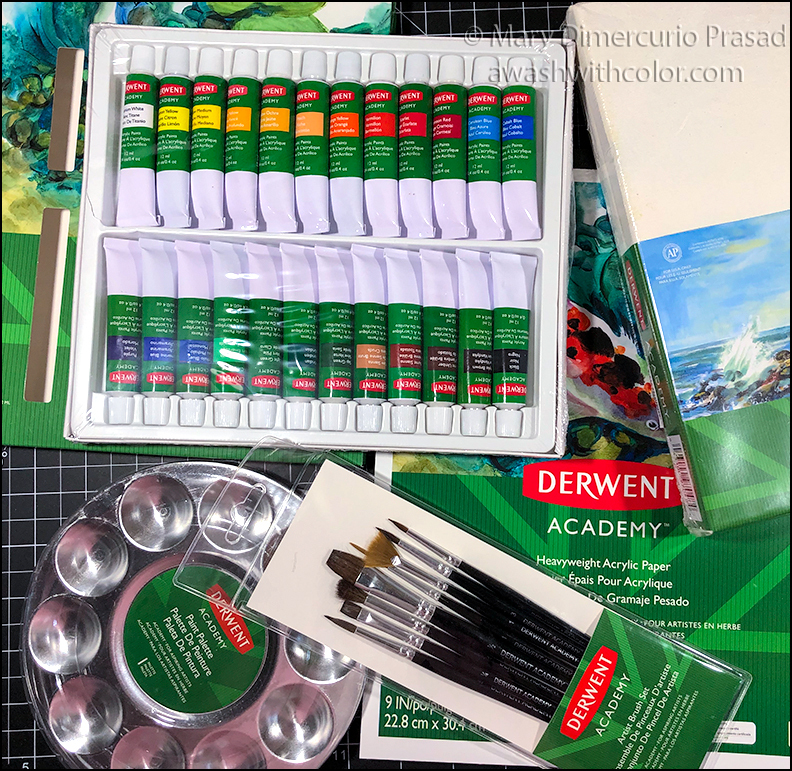 Follow my blog with Bloglovin so you won't miss any of the acrylic painting fun!